Over the Christmas period last year I was thinking about what races and challenges I would take on in 2018 and how I would manage my usual training, especially as we had a new arrival in the family, our first child Joey. I spent hours mulling over different scenarios and whether I would manage to get the time on the bike that I needed, manage the 3-6 hour weekend long runs or be able to maintain the consistency required to be competitive on a national level…Or did I have the motivation to do all that, as the time away from Rachael and Joey was precious especially in the first few months. I figured that the shorter distances of the national adventure race series would suit best as these races are all around the three hour mark and therefore only require short intense efforts and training for this would be more manageable than say an endurance race such as The Race. I did however have an entry into the TDS 121km race at the UTMB in France so I had to keep my toe dipped in the ultra-running scene and decided to include a couple of trail runs in my race schedule including the Maurice Mullins half in Wicklow and the iconic Transvulcania on the Canary Island La Palma. I had initially planned to start racing in March but come early February I felt in good shape; I was managing to get early morning training sessions in consistently as Joey was sleeping through and my times on my usual training routes were at a race level. So I decided to head for Quest Kenmare for the first round of the national series. Travelling down I was thinking about my previous trips to Kerry and it didn’t exactly fill me with confidence; a miserable Itera experience which saw my only DNF to date and a massive bonk while leading Quest Killarney in 2016. Arriving in Healy Ray country I was pleased to stumble on the Tom Crean Fish & Wine restaurant, owned by the famous polar explorers’ grand-daughter Aileen. I have a keen interest in polar travel and the heroics of Crean, Shackleton, Amundsen and the like and this discovery actually lit the fire I needed to set the Kerry disappointments straight! On the start line it was pouring rain and being February the temperatures were still in single figures so it was going to be a day for the hardy. I had studied the start list and saw two names that required some respect; Cork triathletes Cathal O’Donovan and Mark Nolan. 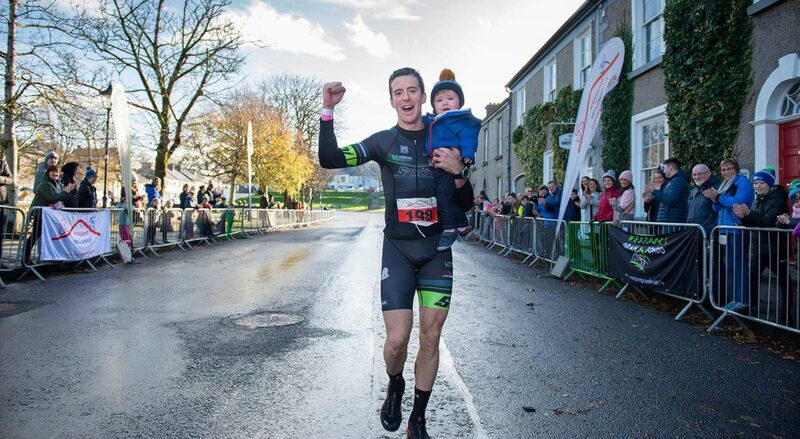 Having not raced Cathal before I didn’t know much about him but what I did know was that he’s a two-time national duathlon champion and was fifth at the elite European Championships in Austria 2017 so he was going to take some beating. From the start Cathal set a frantic pace on the bike, not surprising as he was riding for Aqua Blue’s domestic team, but I held on to his wheel with Mark also in tow. Transitioning onto the first run Cathal bolted out and I soon found myself struggling to hold his pace and thought to myself “if I keep this up I’m going to blow, so good luck to him if he can sustain this” and I backed off hoping I would see him again later in the race. I settled into my own race and once back on the bike my aim was to secure second place, that was until the final 3km of the bike when I could see the lead motorbike up the road..race on! A quick transition of the bike I found myself closing the gap on the run towards to the kayak and once on the choppy water I passed the leader and put in a massive effort to open a gap before the final 3km run to the finish. My first victory of 2018 and I was delighted with the how I managed my race, in previous years I would have done one of two things; 1) Tried to stay with the leader and blown up early on 2) Dropped the head and let the race get away from me. Thankfully with experience I had made the long journey from Donegal worthwhile and got the year off to a great start. Next up was the Maurice Mullins trail race which takes in 26km of the Wicklow way and includes 1000m of ascent. This race was also a qualifier for the national team to race at the European trail running championships with the top two gaining automatic selection as long as the required time of sub 1 hour 50 minutes was achieved. To say I hadn’t this in mind would be a lie but I knew that it was going to be a big ask, especially with the likes of Ian Bailey and Eoin Lennon on the start line. From the start I was on my limit and I stayed there for the first 6km with the two lads until I slowly let the gap open and soon found myself in fourth place. I kept the head and aimed for a pace that would see me go under the 1.50 mark but with no specific training and little running mileage in the legs I finished in 1.53 to hold onto fourth place. April saw a return to Wicklow for round two of the national series at Quest Glendalough. Travelling down on the Friday I stuck to the same routine that saw me take victory in Kerry, eating in the same place, same food, same thought process and a quick look at the start list. On that list would be my main challengers for the overall title, Cavan men Killian Heery and Dessie Duffy. Quest Glendalough has a sadistic start with 8km straight up hill on the bike before a nice mountain run and more Wicklow hills on the bike. On the second bike section it would be myself and Killian working together (a reoccurring theme for the rest of this blog!) and waiting to see which of us would make the decisive move to take the lead. It was on the 6km trail run to the kayak that I edged a gap and opened an advantage that would see me come off the kayak about two minutes up on second place. However a race marshal had other plans for me and sent me on the scenic route towards the finish line, I found myself running a boardwalk filled with Japanese tourists. Thankfully this path merged with the proper route, but I had run approximately 400 extra meters and lost a chunk of my advantage but managed to hold off the chasers for my second victory! Quest Glendalough with Killian 2nd and Dessie 3rd. With two early season wins under my belt I had planned to then switch my attention back to trail runs and return to the series in October. So it was back to long runs in the mountains in preparation for the 75km Transvulcania in May. I would travel to the island of La Palma via Tenerife and meet up with my good buddy Lonan O’Farrell who was also racing. We both stood on the start line at 6am at the lighthouse Faro de Fuancaliente on the southernmost point of the island along with 1700 other runners from all over the world. We both had aspirations of a top 100 placing and if things went well maybe a top 50, which would see us amongst the elite runners. With no start grading we found ourselves well back from the start line with hundreds of slower runners in front of us, we thought about being ignorant and pushing our way through the crowd to get close to the front but we were like sardines and there was no moving! Once the gun went we weaved our way through the field to get into the top 100 runners before we hit the narrow single trail on the first major climb. The sun began to rise and I was soon running in a small group which contained the top ladies. Being relatively short at 75km, I didn’t hold much back early on and I felt really strong going through the marathon distance but soon after with the effects of the midday sun I was starting to cook and was covered in salt. I had made sure I was drinking as much as possible and replacing the electrolytes but the lack of mileage in the legs began to show. When I reached the high point at Roque de los Muchachos I had a 20km descent before a final 5km uphill kick. This 20km descent sounded like fun but with 50km done I struggled to “run” the technical downhills and I was on autopilot towards the finish, eventually crossing the line in 62nd place. Soon after Lonan cruised in to a superb finish and we both sat behind the finish line taking in the atmosphere and trying to open our shoelaces without cramping! Transvulcania is a bloody tough race and has some serious trails with sharp volcanic rock making it technical and not too pleasant if you fall. It is a race that any trail runner should consider, even though it is a bit of a logistical nightmare getting there. After a couple of rest weeks, the plan for June through to mid-August was to do two big training blocks for the TDS. However I was keen to score more points in the national series as I knew I wouldn’t be racing in Achill or KIllarney and Killian was more than likely going to win both leaving him level with me. I had planned to race Dingle but wasn’t sure if I could make the 7 hour drive with work commitments. Thankfully I decided to go, as once off the first bike section I had a dominant performance over the 20km run taking in Mount Brandon. I had probably the worst kayak of my life due to cross winds but luckily I had built up a large lead during the run allowing me a comfortable finish to take my third series win. A few weeks later and a last-minute decision I was on the start line of the Moxie adventure race in Blessington, Co.Wicklow. I had never raced here before and the course looked great, simple logistics with just two transitions and the weather was scorching. Right from the start Barry Cronin and Killian set the pace and I found myself hanging after 1km! I couldn’t get my heart rate down and was suffering big time, soon letting the two boys go and wondering what the hell was going on. I slowly pulled Barry back and came to terms that I probably wouldn’t see Killian again until the finish line. In a nutshell, I suffered like hell, thought about pulling out, felt like lying down on the side of the road, but instead kept pushing with Barry and eventually nipped him for 2nd place and 99 points. Sometimes you’re the hammer, sometimes you’re the nail. With six weeks to the TDS I kept up the running, focusing on mountain runs and keeping the body strong. I had been involved with helping Eunan Quinn and Excel Sports to develop the Seven-Sisters Marathon course and had run the route a couple of times as training. So when the event date was released I decided I could use the race as a hard training run and a good way to get time on the feet with lots of elevation! I wasn’t overly concerned with the result but being a home event I wanted to put in a good performance. With the race starting at the base of Errigal, we stood beside the sculpture dedicated to Jason Black’s 2013 Everest Summit and on the morning of the race I woke to the news that Jason had just summitted K2. This was in my mind throughout the race and I was well aware that Jason was still descending the mountain while the race was going on. Thankfully I won the race in 5 hours 58 minutes and Jason safely made it back to camp 2! Hopefully this race will grow and be around for years to come. The weather was terrible on race day but this is one of the most challenging and beautiful routes in the country and I hope to race here year on year. Two weeks later I would find myself racing the roads of Donegal once again during the Beast Adventure Race with Team Rachels Irish Adventures. I had raced the Beast last year with my brother Patrick and the afore-mentioned Jason and Sharon Black, putting in a strong performance until a crash put an end to our event. This time I would team up with three very experienced adventure racers; Colin Buckley a Marathon de Sable finisher and all round hard man from Cork was our navigator, Nigel McKernan has raced all over the world and would also keep me pointing in the right direction and lastly Rachel Nolan, a proud Mayo woman and probably the strongest member of our team, mentally and physically. The race began with two pretty long swim sections, thankfully I managed to avoid drowning and once on dry land we pushed hard during the first 65km run/hike to find ourselves in 2nd place. During the first night our spirits were high until disaster struck when Rachel minched her rear mech on the bike. We broke the chain and made the bike a single speed, meaning Rachel had to ride the remaining 80 odd kilometers in one gear. I would tow/push her when needed and she would run the uphills while one of us cycled with her bike in tow. Once off the bike we had to kayak to Arranmore island and complete a 16km run around the island before spending the next 5 hours in a kayak collecting check points around the various islands of the Dungloe coast. It was now approaching 10pm and our second night out without sleep and our bodies would begin to shiver if we stopped moving. After some hot food and a change of clothes we made our way to Cruit Island where Ian Miller from Unique Ascent had set up a Tyrolean pass (basically a zip line) between two cliffs! It was now 1am, sleep deprived and in third place, we had to step over the edge into the darkness and zip across the dark void with the sound of the raging sea below. Definitely a memorable moment and an excellent part of an epic race. We still had a 100km bike section, 16km hike and a final 25km bike to finish. Cycling through Gweedore I was in serious need of sleep, no amount of sugar and caffeine could keep me awake and I found myself falling asleep on the bike. After another hour of slapping my face and shaking my head, we decided we all needed sleep so we ditched the bikes and lay on the side of a bog road for a 15 minute nap. I put on whatever clothes I had in my pack, wrapped myself in the emergency bivy and set my alarm for 15 minutes time. On the sound of the alarm I heard Rachel shout “right lads lets get going”, I felt like hitting snooze for another 15 minutes but we had a race to finish! Pushing on through into the next morning we eventually made Roarty’s shop in Dunlewey where we bought some hot food. The shop keeper said a team had just passed about 15 minutes ahead of us. If ever we needed a boost this was it and off we set in pursuit of 2nd place and Team DAR Dingle. The next stage was a 16km loop around Muckish mountain, my second home. Needless to say we didn’t need the maps on this section and we gradually closed the gap on DAR and eventually took over 2nd place on the Miners Path climb up Muckish. However there was plenty of drama left, we fixed a slow puncture on Rachels bike and then some 10km from the finish she broke chain number two! With no magic links left Rachel set of running, while we took turns to cycle with her bike in tow. We eventually crossed the finish line in Letterkenny after some 54 hours of non-stop racing (with 15mins of sleep) to claim 2nd place overall. An excellent result considering it was our first outing as a team and hopefully we can race together again in the future. The Beast is an epic race and I would love to see it take off in the county, yes you need a good navigator to be competitive but I feel more locals should take on the challenge as this is true adventure racing and not some soft pre-marked route with all the luxuries of home. Plus the best in Europe will be coming here in 2020 for the European championships so it would be great to see a strong local team racing. Immediately after the Beast I had a family holiday in the south of France; time for some rest before the final couple weeks leading into the TDS 123km trail race. Staying in the foothills of the Pyrenees I ventured for a couple short but intense trail runs just to keep the weight off and stay mentally in tune. Towards the end of the holiday I decided to do a speed session on a road behind the hotel, bad idea..I was running in pretty minimal trail shoes on a hard road surface and strained my Tib Anterior Tendon. I didn’t think much of it and flew home thinking it was fatigue from the Beast. That was until my next run, after about 6km I was hobbling and limped home to a swollen ankle/shin which took three days to go down. Some physio and cryotheraphy helped the tendonitis but I had to take the remaining 12 days totally off leading into the TDS. Far from the preparation I had hoped and as I boarded the plane to Geneva I was tender going up the steps and I wasn’t even sure if I was going to start the race three days later on the Wednesday. Once in Chamonix I went to the river to dip my leg in to keep the inflammation down and the glacier melt certainly numbed it! On the Monday I spent the day crewing for my brother Patrick who was running the 42km MCC race and it was nice being on the other side for a change. On the Wednesday morning at 5am I boarded the competitor bus to take me to the start line in Courmayuer, feeling okay but uncertain as to what lay ahead. I arrived at the start line about 45minutes before the race start and sat on the ground about 5 metres back from the start line, meaning I didn’t have to pass hundreds of runners like in Transvulcania. It was here I got chatting to a certain Ryan Hogben, an Englishman who has set up home in the Chamonix valley and living the dream. Turns out Ryan is in charge of Tailwind France; the excellent nutrition product that I have recently started using on the advice of Lonan…more on this later. Once underway it was straight up a ski slope and into the big mountains that surround Mont Blanc. To go into detail would take a whole blog on its own, but basically I was running well as my injury was okay on the uphill and annoying on the downhills, never really so bad that I had to stop but it definitely held me back. I met Patrick and Lonan who were crewing for me after 50km, I stocked up on food and set off into the mountains again for another 25km before I would see them again. It was in this section that the wheels well and truly came off, what happened I’m not quite sure but I ended up sitting on the trail puking and was immersing myself in any water source I could find, rivers, waterfalls and animal troughs. I was totally dehydrated and overheated, even though I had been managing my fluids quite precisely. I guess I had gone to the bottom of the well one too many times and drained it dry. I was so slow that my Suunto watch showed it took me 26 minutes to cover one kilometer during this period. I eventually made it to a mountain refuge where I bought a can of 7-up, I opened it and let it go flat then slowly sipped it over the next hour, finally keeping something in me until I emerged from the mountains and met the boys again at the next check point. Here I accepted the fact that I was no longer going to achieve my goal of 18 hours and finishing was now the priority. As I left this check point there was an almighty thunder-storm, with hail stones and snow falling on the high mountain passes, quite a change from the high 20’s of earlier in the day. Onwards I would push for the next 12 hours, still sitting in the top 150 runners but just getting it done rather than racing. The climbs in the alps are so steep and relentless that its hard to replicate at home, maybe Errigal is a good comparison but it would need to be three times higher. As I left the third last check point around midnight to descend towards Notre Dame de la Gorge I stumbled on an English woman who was lying by the side of the trail, I stopped along with a Swedish guy to see if she was okay and it was pretty obvious from the angle of her foot than she had broken her ankle. I stayed with her for about 10 minutes until two medics arrived, I guess there’s always someone else worse off I thought and headed on through the mist. In hindsight I hadn’t given the event the respect and training it deserved. I raced too much in the lead up instead of focusing on periodised training and rest. In comparison to last year’s CCC where I dedicated three full months of training towards it resulting in a 53rd placing and a strong performance from start to finish. I guess I got what I deserved and after 22 hours of suffering I crossed the line in Chamonix just before 7am on the Thursday morning. Later that afternoon I was on the plane back to Dublin, disappointed but satisfied that I finished and was no worse off injury wise than before the race. After the TDS I decided that I needed to totally reset, so I took three full weeks off with zero exercise, just caring for my tendonitis and some gentle stretching. This was exactly what I needed and on returning to training my injury had cleared up and although I felt a bit sluggish I was healthy. In the pursuit for the national series I had registered 399 points from a possible 400, but while I was off trail running Killian had won both Achill and Killarney as predicted to leave him also on 399 points. This forced my hand into making the long journey to Skibbereen for the SCAR adventure race. Arriving on the Friday evening I bumped into both Killian and Barry Cronin, both of whom would be pushing me for the victory the next morning. The race started with a speedy 12km trail run and thankfully I had much better legs than the last time I raced these two at Moxie. Myself and Killian traded punches all day until the final transition where we both sprinted the final 250meters to the finish line on the Castlehaven GAA pitch, where I managed to take the win by a matter of meters. This result left me on maximum points and therefore Killian had to win the final race in Westport in order to draw level and result in a split title. With three weeks til the final showdown at Sea2Summit, I continued with the intensity of training and knew that I would have to be on top form to win in Westport. This year has been the first time I actually had a clean run into S2S, usually I have a sniffle or a cold from the first term back at school and this always hampers the training and performance at this race. It may seem minor but these are the small margins that matter when so little separate competitors. Sea2Summit is probably the most well-known adventure race in Ireland and it includes the iconic Reek, a mountain I love to run. I had raced here four times before, taking second place twice, once behind Lonan and last year to Killian. In both cases I had been in a head-to-head on the final 4km run and didn’t have the reserves to finish the job. This year I made sure I had trained properly, including runs off all my training rides to get the legs used to the transition. And so it was race day and it went as I had imagined, a small group formed after the first run which included two fellow county men Edward Harkin and Eamonn McGee. On the ascent of the mountain myself and Killian opened a small but substantial gap and Killian applied the pressure on the descent seeing us come down from the summit in 16 minutes. Back on the bike we worked together and rode into the final transition knowing that it was now or never. I had a fast transition and exited some 10-15 seconds ahead of Killian. I pushed hard for the next two kilometers until I had opened a gap and I was really suffering at this stage but I was in control of the race and knew that I had to suffer for just 7-8 more minutes to the finish. As I went through the final tunnel on the greenway I knew I had the victory, so as I entered the finish straight I spotted Rachael and Joey along the barrier and I took the time to reach for Joey and ran across the line with him aloft! Finally I had won S2S and I had secured the national title outright, job done. With my 2018 race season over I have to thank a number of people who have helped me throughout the year. First of Lorcan Roarty from Wild Atlantic Camp who sponsored me from the outset this year, Lorcan has done so much for the village of Creeslough and I am delighted to have carried the Wild Atlantic Camp logo on my trisuit countrywide. Thanks to Jason Black who backed me all year and I proudly raced with Voodoo Performance on my back. Thanks to my brother Patrick who has had his head demented listening to me all year and was always on hand when I needed crewing or advice. Also to everyone at Ards Coffee Tree for their support all year. I must thank everyone who cheered me on in Westport and for all the messages I received throughout the year, they do mean a lot to me. Finally, Rachael and my wee man Joey who allowed me the time to train and race throughout the year. Rachael is super supportive and I can honestly say I wouldn’t have the results this year without her support and backing. To be competitive you have to be somewhat selfish, yet I wanted to make sure that I was never too far away from the family so I tried to do the majority of my training in the early mornings or late at night. I feel that having Joey has helped me focus on my training more, with my sessions consisting of quality over quantity and a lot less junk miles. I will be taking a couple of weeks off to rest and maybe start planning for 2019. I have a couple of lottery applications in for Western States and UTMB so fingers crossed one of these will come through. If so, my year will be dedicated towards preparing for my first 100 miler. If unsuccessful then I’m not quite sure. Will I defend my adventure race series title, maybe, but it involves a serious amount of travel and has a large cost element also. For now I will focus on some rest and enjoy the run into Christmas. One major improvement I made in the second half of this year was switching my nutrition to Tailwind. I can honestly say it has made a massive difference, as I haven’t had any bloating or puking issues since I started using it and I will continue to use their products into 2019 for sure. Another exciting prospect for 2019 is that I am a brand ambassador for the French clothing company Uglow. Their gear is very popular on the continent and having received a number of items so far it is super comfy and is by far the best products I have used. So for 2019 I will be proudly racing in some shiny new Uglow gear! Check out their running gear here.